This bonsai was developed from a four year old sapling of Tsuga heterophylla collected in late 2005. 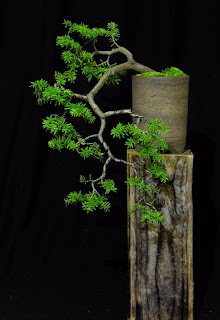 Over the years it will thicken considerably, the foliage pads will be futher refined and the first branch will be brought both under and over the trunk to draw the eye from the point where the orriginal second branch was lost. It is already a pleasing tree, despite its faults. The pot is made by Alan Harriman of China Mist Pottery, in time, with the thickening of the trunk, it will suit the tree very well.